I’ve decided to be flexible about the cut-off date for the first phase of this project. I was going to give my young critics only works published before 1980 … but if I want to include a story by Connie Willis , I will have to fudge a little. So, a story from 1982. If I’m going to hand them an early Connie Willis, “Fire Watch” is the logical choice. Not only did it win both the Hugo Award for Best Novelette and the Nebula Award for Best Novelette , it provided the setting for Willis’ Doomsday Book (also a Hugo and Nebula winner) and To Say Nothing of the Dog. And, sigh, the setting for the interminable, nonsensical, and inexplicably popular Nebula and Hugo-winning Blackout/All Clear. Fire Watch is included in The Best of Connie Willis . 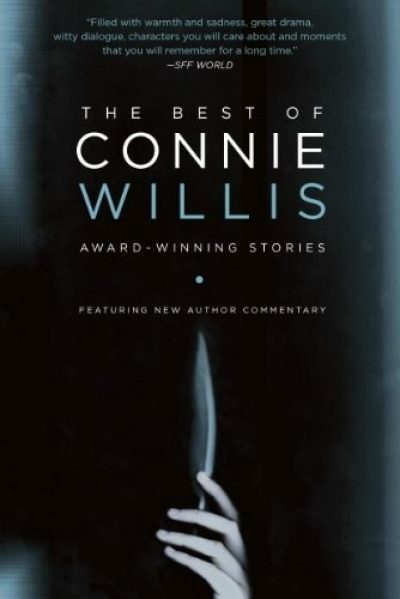 The Best of Connie Willis is available here. 1: I would have preferred a Bujold story, but it turned out that the specific story I had in mind was from the end of the 1980s. I am not prepared to be that flexible. This story didn't keep hold my attention well enough to stop me from wandering off to look at other things while reading it. Which is sad because I can't point to anything I dislike about it. It just didn't hold my full attention. It did take a bit at the beginning to make clear what was going on, and even once it became clear that the narrator was a time-travelling historian there were still bits that confused me. How does someone from the mid to early 21st century not know about cats or alcohol? Even if they've been gone since some time shortly after the 80s (when this story was written) people these days know the names of things from past centuries that we don't use anymore, especially really popular things. How much more should a historian know this stuff? And I am pretty sure the narrator is from the early-mid 21st century from his talk of the pinpoint bombing of St. Paul's being in 2008 and his proximity to that event. Another thing, how do you keep a trick like that secret at a university? The number of people who have to keep quiet is huge, and growing every year. Somebody's going to spill the beans to the undergrads at some point and then the bait and switch ceases to work. Which I don't think would be that big of a problem, the overall point of the test still probably works even if the undergrads are just thrown into the test with minimal prep time available. Conclusion: I liked it, the twist on Langby was great and the punch was cathartic. I just wish the writing had held my attention better. I found this story... hard to focus on. Maybe it was the daunting length of the story, the format (on my desktop computer), the environment I read it in (surrounded by a chatty crowd of people), or my mood today, but I really could not focus on it. I like the premise, I think – future history students do a final exam where they get to travel back in time. Cool! They are woefully unprepared – odd? They have to do... something, and nobody tells them what needs to happen. Frustrating. It should have intrigued me. Possibly historically accurate information where there's a mystery – why is the main character there and what is he trying to do/figure out/learn? But I'm not sure anything was learned, and I'm not sure anything was revealed. Maybe this story would have been better if I'd read it on a different day. After looking it up online, it sounds like it was well-received, and it sounds like an accurate representation of some of the events of London in WW2. But it just didn't absorb, so I'm not really sure what to say. I liked this story, but I couldn’t quite put my finger on why it didn’t blow me away (pun not intended – sad trombone). Maybe there was too much red scare fear. Or maybe Bartholomew reminded me too much of a character I don’t like, like Holden Caulfield. The story starts off strong. A time travel practicum is a great, fun idea – in theory. We’ve all been asked the question: if you could time travel to any other era, when would you go? And almost invariably, anyone who isn’t a white male chooses the present or future. Rights, contraception and sanitation, please. Back to the beginning of the story: I liked it well enough, but I probably would have liked this a lot more when I was a teenager or early in my undergraduate degree. At that point, it would have reminded me of The Secret Garden. Instead, now I think of conversations I’ve had with others about co-op, practicums, and job searching. Much less whimsical as an adult. A little while ago, I would have found the communist red scare fear with the implied nuclear war to be funny. Not so much with recent events. All in all, solid. This story is worth some thought, but it’s not the most fun. A few jarring notes that brought me out of the story like asbestos coats. And how does this guy keep this record hidden and secret for three months? But aside from that, it’s an interesting read worth recommending. This story completely failed to hold my attention. It took me forever to read, because I kept getting bored and wandering off to do more interesting things. I didn’t like the narrator, and his narration didn’t make me care about any of the other characters, or the church they were supposed to be saving. I understand that the narrator didn’t understand what he was supposed to be doing, but it resulted in it feeling like there were no real stakes to the story. I usually like time travel stories, but apparently not when they’re the running commentary of a whiny guy making all kinds of assumptions about the people around him. I didn’t trust his judgement, so I didn’t believe his assessment of any of the people or situations around him. This story was dull, way too long, and even once it was over didn’t seem to have a point.